Keep your down coats cozy by following these simple steps. With the fresh smells of spring in the air, it’s time to trade in our ski jackets, gloves and mittens for shorts, flip flops and sunglasses. But while you’re enjoying the long days of summer, winter will return, and it’s vital to make sure your down coat is ready. We love our down coats for their warmth and puffiness. Which is why we want to make sure they’re in the same condition when we bring them out next winter. Wash the coat once through a regular warm cycle with detergent. Run the washing machine once more on a rinse cycle without detergent. Dry the coat on a very low heat level and throw tennis balls into the dryer with it; you may improvise with balled up socks if you don’t have tennis balls. As down has a tendency to clump, every 15-30 minutes, interrupt the cycle to break up these clumps. Continue step 4 until the coat is 100% dry; you will know when it is almost finished as the clumps of down will split up easier and easier. When your coat is clean and dry, it is time to properly store it for the next half of the year. As down is sensitive, pay close attention to the storing process — it is the most important aspect of maintaining a puffy coat. Allow the garment to breathe and stay uncompressed; compression can damage the feathers and reduce its lifespan. Store hanging freely in a closest. If closet space is limited, place in small laundry bag but don’t stuff it in. A puffy jacket may take up a lot of room, but you don’t want to sacrifice the longevity of the coat for a little extra space in the closet. They are our closest companions in the winter time and deserve the utmost care. 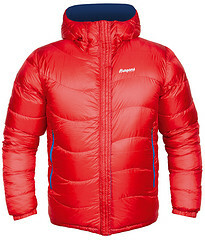 Properly wash and store your down coat for the winter season year after year, and your coat will thank you.